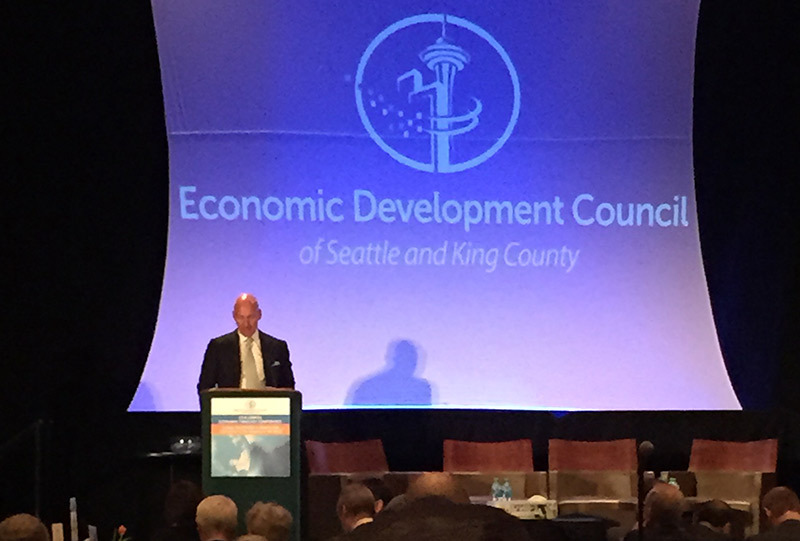 Under Secretary of Commerce for International Trade Stefan Selig delivers remarks to the Annual Seattle Economic Forecasting Conference on January 15, 2015. That was one of the messages ‎I delivered today at the 43rd Annual Economic Forecast Conference, held by the Economic Development Council of Seattle and King County. The Seattle Metropolitan area has already established itself as an elite export hub. In 2013, this part of the country sold more than $57 billion in goods exports, making it the fifth largest metropolitan export region in the country. But today’s event was an opportunity for me to learn about how the Greater Seattle region is planning on marshaling that export prowess to attract foreign direct investment. When Greater Seattle ‎puts together their toolbox for attracting investment, they will find plenty of tools from ITA. That includes SelectUSA, the first ever whole-of-government program to attract FDI.‎ Their experience and success in connecting foreign investors with economic development organizations, as well as their advocacy and ombudsman services are why companies ‎ from China, India, Germany, and South Africa among other countries are setting up shop in the U.S.
Another ITA tool is our work to make the Trans-Pacific Partnership and the Trans Atlantic Trade and Investment Partnership a reality. While these are largely seen as trade agreements, they will also unlock also remove barriers to investment, which should boost FDI for the Greater Seattle region and the country. Finally, we hope to bolster their public support efforts by doing our part to remind people that trade and investment is a platform for the best goods and services in the world, made by the best workforce. On behalf of ITA, I would like to once again congratulate the Economic Development Council of Seattle and King County for this plan, which will surely make the region a leading hub for FDI. You can be sure that we will be there to help along the way.